Hello, all! Today I have two fun things for you. 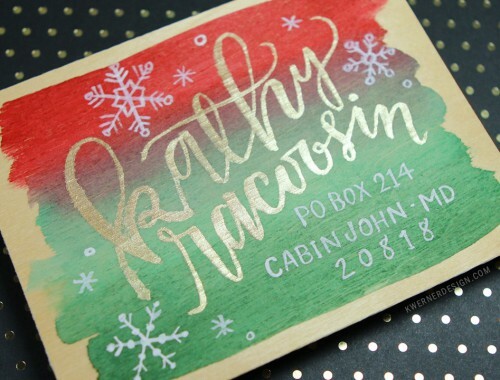 The first is a lettering project with FineTec pearlescent watercolors. The second is a fun opportunity to join fellow crafters on a vacation! Currently, I’m out of town and staying with some friends. 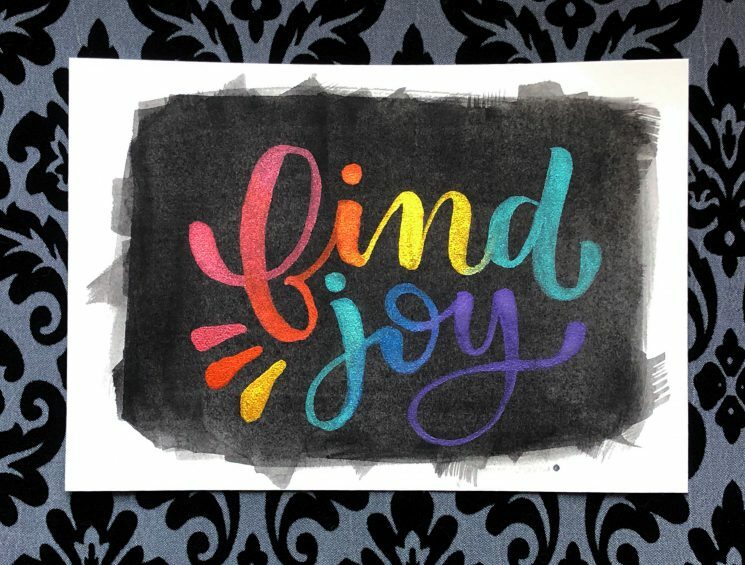 Thankfully, I was able to steal away for a bit this afternoon so I could create this “Find Joy” lettering piece. Thanks, Candy, for letting my use your beautiful craft room for a bit! I first watercolored a dark gray background. 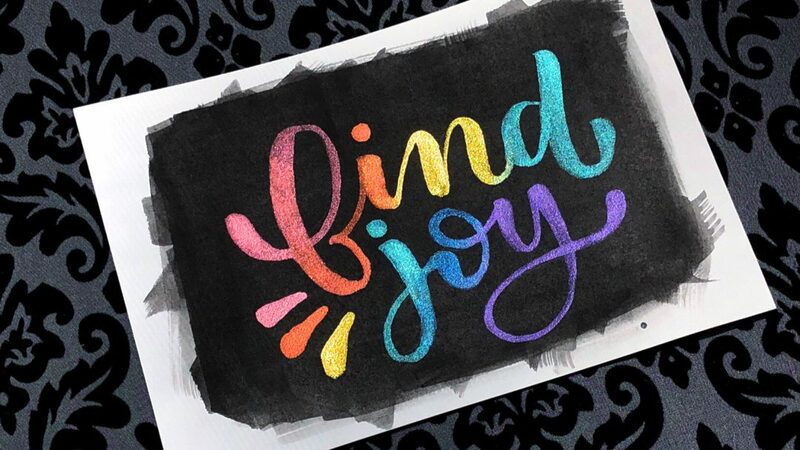 After letting that dry, I used the 12-color FineTec set of pearlescent watercolors to do some brush lettering with a Pentel Aquash Brush. Anyhow, onto the cruise details! I also wanted to let you know about something I’ve been thinking about doing for years. It’s been ten years since I went on my first cruise vacation and I’ve always thought it would be fun to gather a group of crafters to go on a cruise together. So here we are! We’re cruising the Eastern Caribbean in February 2019, and you can come, too! What makes this a crafty cruise? Is it like other cruises with crafting classes? Unlike other crafting cruises where there is an additional fee for classes and materials, there is no additional fee. There are no classes. Everything you pay will go toward your cruise fare. If there aren’t crafty classes, what will we do as a group? 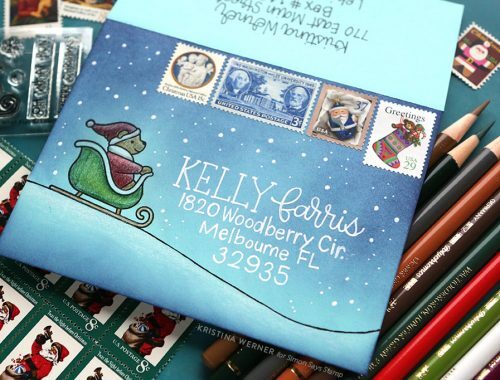 I am arranging with the ship to have a room with tables reserved for our group on sea days (the days when we will not be in port) so that we can stamp, paint, create cards, etc. if we want to. That means if you have a friend or relative who does a different type of craft (like knitting, crocheting, stitching), they can come, too! We will be crafting using our own supplies (whatever you can fit in your suitcases! LOL!). We will be gabbing, laughing, and creating with our new cruising friends! I’m also working with the ship to get a space for us to meet as a group before dinner for cocktails. I anticipate we will be a somewhat larger group, so sitting all together at dinner will not be possible. Meeting before dinner will give us a chance to meet each other. All cruise passengers in our group will have the early dining option so that we can plan accordingly. After paying your deposit for the cruise, I will contact you about joining a private Facebook group just for our cruise. We can talk there and plan other group activities (like if a small group wants to do shore excursions together). I can also answer questions there. How does this work? What is double occupancy? Cruises are usually sold as double occupancy. This means that there are at least two passengers per cabin. You can bring whomever you’d like, whether they are crafty or not. They will not have to participate in our crafting days. So you could bring a spouse, relative, friend, or anyone who wants to hit the high seas! Most cabins will accommodate only two passengers. But there some cabins that will accommodate up to four passengers (with the 3rd and 4th people paying less). So if you have a group of four who want to come, you could split the entire cost of all four cruise fares into four equal parts and save a few bucks. Rooms with 3rd and 4th passengers have pull-down beds (like bunk beds) accessed by step ladders. Pricing provided on the website is for double occupancy ONLY. Anyone who is interested in single occupancy or would like to have 3-4 passengers per cabin will need to email the travel agents who are making this possible at [email protected] Markell or Travis will then contact you with pricing details. We have a set number cabins set aside for our group. They are first come, first serve and based on the interest I received over at Instagram, I think they will sell out quickly. If your desired cabin type is sold out, you will need to contact Travis or Markell at [email protected] directly for cruise availability and pricing. Passengers that book prior to April 30, 2018, can also take advantage of Princess Cruise’s Come Back NEW Sale. Booking under this sale gives passengers Pre-Paid Gratuities and reduces the deposit to $100 per Passenger. Plus, Travis and Markell will be gifting $50 Onboard Credit per stateroom as a thank you! How do you reserve a cabin? After reviewing the website for itinerary details, pricing, and bonus offers, click the REGISTER TODAY icon. From there, you will make a cabin selection, enter passenger information, preferences, and then review your registration. The last step of the registration process will be receiving a confirmation email within 24 hours of submitting your registration form. From that point Travis or Makell will contact each guest for their payment information. Cabins will not be officially reserved until a deposit is made. 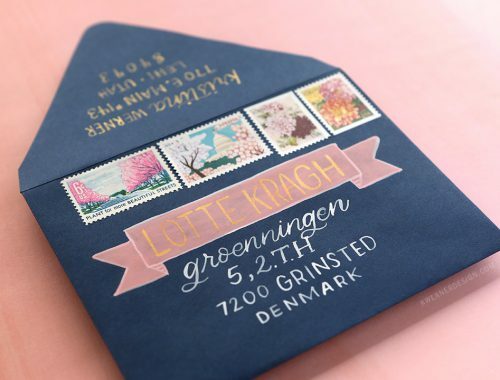 It is important that the passenger information matches your passports and the address provided is your main mailing address as it appears on legal documents.